The Cumberland & Dumfriesshire Farmers Mart held their Sale of Prime Cattle in Dumfries on Wednesday 12th December 2012. Show and Sale of 1564 Prime Lambs – The Judge Mr Haig Murray from Dunbia Ltd awarded the Championship to a pair of Beltex x Lambs from Mr B Ryder, Newton Cottage scaling 43Kg and selling for £140 (318p) to Bowood. The Reserve Champions also Beltex Crosses shown by Messrs D & D Aitken, Upper Cleugh made £120 to J Kerr & Son Butchers Gretna. 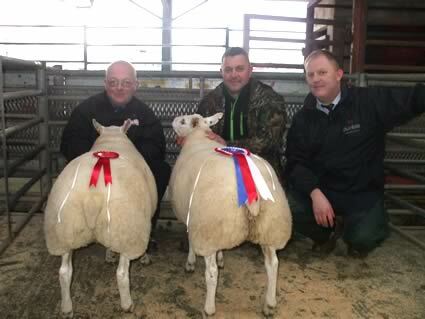 Pen of Lightweight Lambs per Kilo through the ring was awarded to Chanlockfoot.